See that? That’s how much I believe in my method. 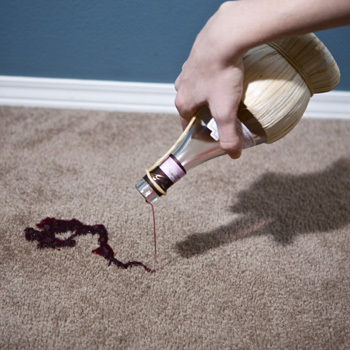 I actually, intentionally, poured wine all over my carpet. The things I do for this site! So lets say this was an accidental spill. Red wine. Muddy tracks. Or . . . pet pee. First – and quickly – you’ll need to grab your rags and your vinegar spray bottle. Every green-cleaning household should have these on hand! Rags can easily be made out of an old towel or tee shirt. You can always recycle an old spray bottle, perhaps leftover from your ‘chemical’ cleaning days. Fill it with a 1:1 solution of vinegar and water. 2) Continue blotting until you’ve soaked up as much of the liquid as you can. 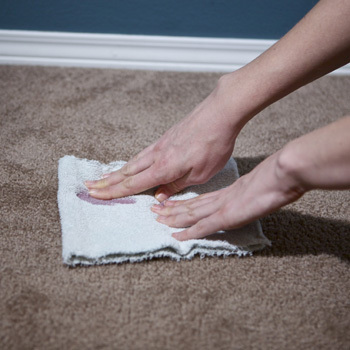 3) Take your vinegar and spray the area – liberally. Get it good and wet. Then let it sit for maybe 5-10 minutes. 4) Now you just need to soak it all up. The blot method will work again here, but you can scrub it if you want. Scrubbing can be pretty satisfying, ya know?? 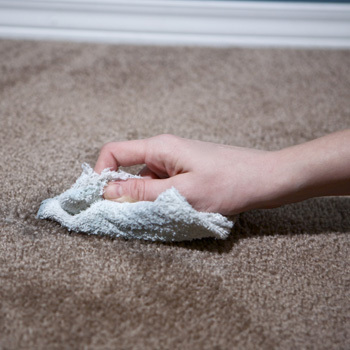 Your stain should be removed, though you may not be able to tell with the carpet still damp. Don’t worry – just check back on it the next day. Now, if you’re concerned about odor (like with puppy piddle), the next day you can sprinkle the DRY spot – and only once it’s dry – with baking soda. Rub it in, let it hang out for a few hours, and then vacuum it out. For pet urine, I dump Borax on it – pulls it right out of the carpet!! I’ve even used this method on old stains and it works pretty well. One thing to note for already-set-stains is that it may take some time (this won’t be the quicker-picker-upper method), but I’ve cleaned up mystery dark spots on my unfortunately beigeish carpet (oh, the dream of hardwood) with liberal vinegar and much blotting. 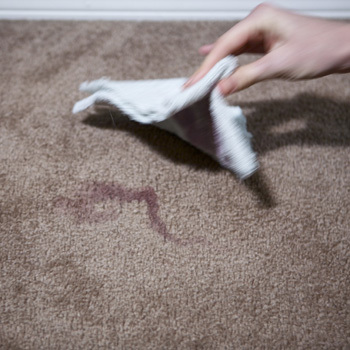 Hydrogen peroxide will completely remove wine and blood stains, also. Thanks for all the tips everyone! I’m glad I’m not the only one out there with a green carpet cleaning method. I’ll have to try all of these! Though I hope my pup doesn’t have an accident, she probably will at some point or another. :p I’ll have to try this sometime soon. I have a question about keeping vinegar in the plastic spray bottle. I’ve had bad luck with spray bottles-the vinegar tends to eat straight through the rubber… gasket? on the sprayer. These are professional grade too since I’ve long run out of recyclable sprayer bottles. So, it’s useless in a matter of months. I also keep some in an old wine bottle with a pour spout, but sometimes I need to spray. Any way to prevent this or a certain bottle people have had good luck with? Also, vinegar is the perfect antidote to the smell of kitty pee-even on playsilks… Eww! @ Lily – You’re welcome! @ Kaye – Aw yep, it happens. My poor 4 year old pooch just had one today! @ Sarah – Hmm, I’ve never had that problem but I’ve only been keeping my vinegar in the spray bottle for a little under a year. I don’t really know what to tell you, except that I’ll have to research that. And I’ll definitely keep an eye on my own bottles,s o thanks for the heads up! But now I’m nervous that I did something terribly wrong! Not ‘end of the world’ terribly wrong, but still…I am curious. thanks! @ ann – It’s because some liquids (like red wine!) can react poorly with the bs/vinegar and leave a discolored mark (like green!) In this recipe, the baking soda is only acting as a deodorizer, once the mess is clean and dried. But no worries, if you haven’t had a reaction you haven’t done anything ‘wrong’! Just something to be aware of in the future. Love the vinegar idea. I’ll have to try it! I also use baking soda to scrub my tub. My boys tend to put water in their mouth and then turn into human water fountains. Because of this and other reasons I hate using chemicals! Note: that if you have a male dog you will want to establish yourself as the alpha with the sent to mark “your territory”. We have always used white vinegar after cleaning up the puppy piddle. The smell dissipates for humans but not the doggie. I also used this method on a spot formed by a little bit of gum that got stuck in our carpet and made a black spot. It cleaned it right off! 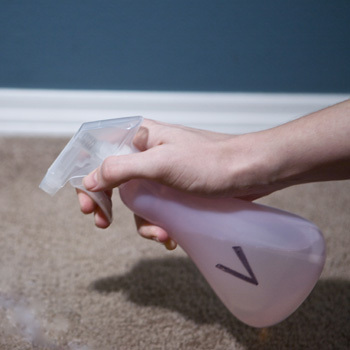 I used this method on my floor but since they weren’t so bad of stains I just sprayed on and scrubed off. They were chocolate milk tht hv been there awhile. It worked excellent. Thanks for the great tip. I hate the smell of viniger but since it worked this awesome I totally willing to deal with the smell. Plus I hv insensese…lol.